Well in the case of the pticher pictured below, it wasn’t a stone, but rather the backyard patio floor that it made contact with, and yes, it was bad for the pitcher. The pitcher was on the patio table the night of last week’s hellacious winds, and just as I was not smart enough to heed the weather advisories and take down the adirondack chair I’d put on the roof last summer, so was I not smart enough to close the patio table umbrella, which at some point during that mostly sleepless night caught what must have been a pretty spectacular gust like a vertical sail, which then lifted up the entire table and moved it about three feet from where it had previously stood. 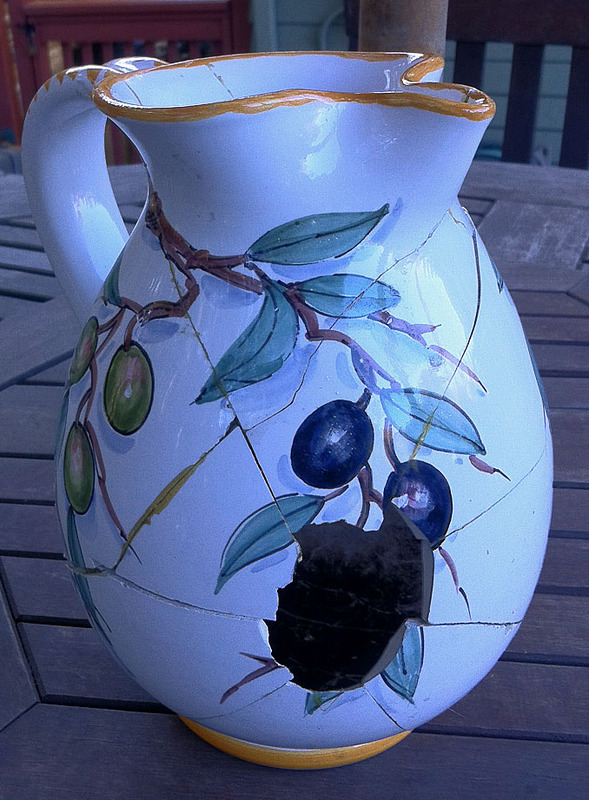 Consequently, the pitcher — brought back from Italy by Susan during our 2007 cruise around that country’s seas — tumbled to its doom upon the concrete. Dutifully I gathered up all the broken bits big and small and badly reassembled them — with the exception of that silver-dollar-sized hole in its belly, the pieces of which I can only list as missing and presumed pulverized. These reconstructions are a strange habit which I’ve had for most of my life. I think the compulsion to reconstitute what’s been deconstituted is tied to that same unavoidable drive I had to “clean” the graffiti off our garage doors couple months back (and in turn make a bigger mess that the city eventually came and painted out — but it was MY mess, not the taggers). In this case, like the ladybug pot that also shattered that night, it’s not about fixing what’s broken or returning it to its previous unmarred fully functional state. My intent is driven by sentimentality not meticulousness. I mean… just look at it: it’s days as a liquid-bearing vessel are gone. But its days not even nearly good as new, but better, have begun. This entry was posted on Wednesday, December 7th, 2011 at 3:03 pm and is filed under slice of life, tinkering. You can follow any responses to this entry through the RSS 2.0 feed. Both comments and pings are currently closed.